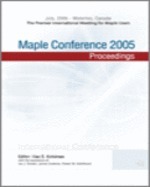 The Maple conference is the premier international meeting for users of Maplesoft products. Highlights of the 2005 conference included keynote addresses from renowned personalities including Dr. Brian Ford, a pioneer in numeric computation, and Dr. Richard Gran, a former chief engineer in the American space program. Contributed sessions drew over 50 presentations from a wide range of fields. Edited by Ilias S. Kotsireas, the proceedings for the contributed portion of the conference is a printed volume that contains refereed papers in the categories of "Science and Engineering", "Mathematics and Mathematical Compuation", and "Maple in Education".